What Is the Capital Budgeting Process? The funds that businesses have to invest are finite by nature, yet there are always ample opportunities for how to invest them. Capital budgeting allows managers to use method to allocate scarce capital to such investments in the most value accretive manner. Money also has a time value component to it. $1.00 now is worth more than $1.00 received in five years’ time. Why? Because the money received now can be invested and grown within that five-year time scale. At the end of the project’s life (if there is one), what will be the residual value of the asset? How Can You Apply Capital Budgeting in Your Business? When purchasing a portfolio of assets, an NPV analysis provides an aggregate view of its total value. With relevant stress tests made on the cash flow and discount rate assumptions, a valuable tool is then gained for pricing negotiations with the seller. For new business units that are being launched inside a company, the first financial step is often accountancy-based budgeting. Augmenting this with capital budgeting will help to demonstrate whether the new venture will actually generate value for the parent. What Are Some Potential Pitfalls to Avoid? Be sure to account for all sources of cash flow from a project. Aside from revenues and expenses, large projects may impact cash flows from changes in working capital, such as accounts receivable, accounts payable, and inventory. Calculating a meaningful and accurate residual or terminal value is also critical. Don’t blindly assume that a seller’s projections are gospel. Net income is not a cash flow. Be careful not to overestimate a residual or terminal value. Using an ambitious, but unrealistic, IPO target as a residual value could be the game changer between a positive and negative NPV. The funds available to be invested in a business either as equity or debt, also known as capital, are a limited resource. Accordingly, managers must make careful choices about when and where to invest capital to ensure that it is used wisely to create value for the firm. The process of making these decisions is called capital budgeting. This is a very powerful financial tool with which the investment in a capital asset, a new project, a new company, or even the acquisition of a company, can be analyzed and the basis (or cost justification) for the investment defined and illustrated to relevant stakeholders. Essentially, capital budgeting allows the comparison of the cost/investment in a project versus the cash flows generated by the same venture. If the value of the future cash flows exceeds the cost/investment, then there is potential for value creation and the project should be investigated further with an eye toward extracting this value. Far too often, business managers use intuition or “gut feel” to make capital investment decisions. I have heard managers say, “It just feels like the best move is to expand operations by building a new and better factory.” Or perhaps they jot down a few thoughts and prepare a “back of an envelope” financial analysis. I have seen investors decide to invest capital based on the Payback Period or how long they think it will take to recover the investment (with everything after being profit). All of these methods alone are a recipe for disaster. Investing capital should not be taken lightly and should not be made until a full and thorough analysis of the costs (financial and opportunity) and outcomes has been prepared and evaluated. In this article, I will describe the objectives of capital budgeting, delineate the steps used to prepare a capital budget, and provide examples of where this process can be applied in the day to day operations of a business. The capital budgeting process is rooted in the concept of time value of money, (sometimes referred to as future value/present value) and uses a present value or discounted cash flow analysis to evaluate the investment opportunity. Essentially, money is said to have time value because if invested—over time—it can earn interest. For example, $1.00 today is worth $1.05 in one year, if invested at 5.00%. Subsequently, the present value is $1.00, and the future value is $1.05. Conversely, $1.05 to be received in one year’s time is a Future Value cash flow. Yet, its value today would be its Present Value, which again assuming an interest rate of 5.00%, would be $1.00. The problem with comparing money today with money in the future is that it’s an apples to oranges comparison. We need to compare both at the same point in time. Likewise, the difficulty when investing capital is to determine which is worth more: the capital to be invested now, or the value of future cash flows that an investment will produce. If we look at both in terms of their present value we can compare values. The specific time value of money calculation used in Capital Budgeting is called net present value (NPV). NPV is the sum of the present value (PV) of each projected cash flow, including the investment, discounted at the weighted average cost of the capital being invested (WACC). If upon calculating a project’s NPV, the value is positive, then the PV of the future cash flows exceeds the PV of the investment. In this case, value is being created and the project is worthy of further investigation. If on the other hand the NPV is negative, the investment is projected to lose value and should not be pursued, based on rational investment grounds. 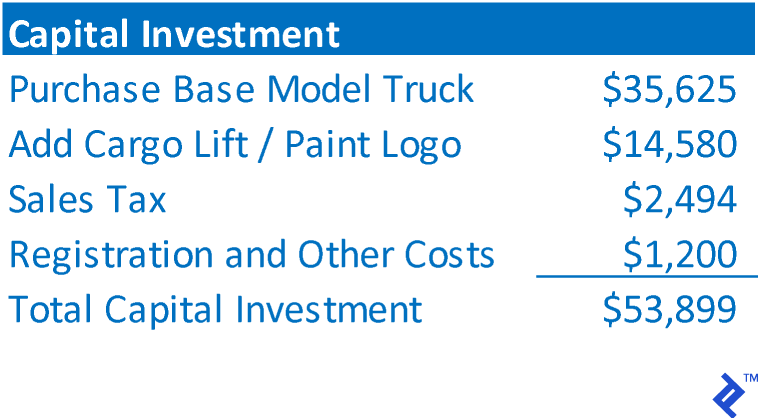 To illustrate the steps in capital budgeting analysis, we will use a hypothetical example of the purchase of a truck to be used by AAA Trucking for making local, short haul deliveries. AAA plans to acquire the truck, use it for 4 years and the sell it for fair value on the resale market. It plans to use the sales proceeds as a down payment on a more modern replacement truck. It estimates the WACC at 14.00%. Step 1: Determine the total amount of the investment. Step 2: Determine the cash flows the investment will return. However, another way to allow for continuing operations is to calculate a terminal value. A terminal value assumes that the cash flow in the final year of the projection will continue at that level indefinitely into the future. To calculate the terminal value, the last cash flow is divided by the discount rate. Using AAA cash flows and discount rate, a terminal value would be $27,286 ÷ 14.00% = $194,900. This terminal value is a proxy for all cash flows that will occur beyond the scope of the projection. Again, a terminal value is used only when the true operations of the investment are expected to continue indefinitely into the future. Calculating the annual cash flows is completed by incorporating the values from Steps 1 to 3 into a timeline. Cash outflows are shown as negative values, and cash inflows are shown as positive values. By aligning cash flows with the periods in which they occur and adding each periods’ cash flows together, the annual cash flow amounts can be determined. Below is the NPV for AAA’s new truck investment. The NPV is positive, therefore AAA has determined that the project will return value in excess of the investment amount and is worth further investigation. To put it bluntly, it is spending money to make more money, which is a fundamental catalyst for business growth. What if the actual cost of the truck is greater than $53,899? What if the operating cash flows are less than anticipated? What if the residual value is overstated? What if the WACC is higher than estimated? 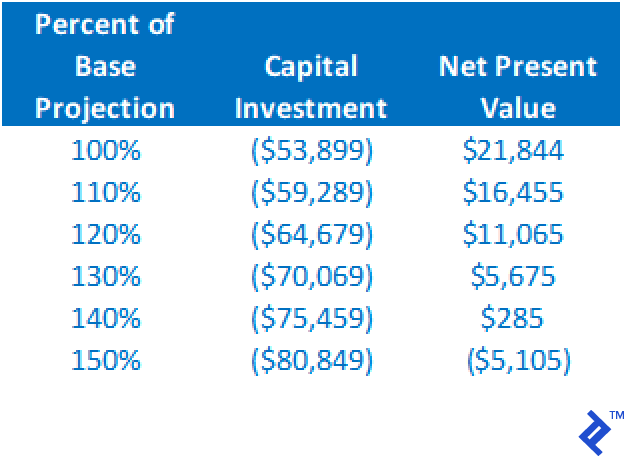 Below is a summary table of the impact to the NPV through altering the capital investment cost and holding all other assumptions the same. Note that an increase to 140% of the baseline estimate still results in a positive NPV. NPV will reduce as the residual value decreases, but we can see from this analysis that even if the residual value drops to $0, holding all other assumptions constant, the NPV is still positive. From just these two analyses, we can see the project is quite stable and robust. Even with errors in the base projections of these two variables, the project still warrants further consideration via a positive NPV. By running various scenarios to determine the impact on NPV, the risk of the project is better defined. If the alternate outcomes continue to provide a positive NPV, the greater the confidence level one will have in making the investment. As I have discussed previously, NPV as used in capital budgeting does not provide a return on investment value. NPV is simply describing whether or not the project provides sufficient returns to repay the cost of the capital used in the project. If a project’s return on investment is desired, then internal rate of return (IRR) is the calculation required. Essentially, IRR is the discount rate that will make the NPV equal exactly $0. It is the rate of return that is directly indicated by the project’s cash flows. Capital budgeting can be used to analyze almost any type of investment from the purchase of a piece of capital equipment, to investing in expanded operations, to starting a new business, to purchasing existing business operations. When I worked at GE Commercial Finance, I held a role in business development (BD). My focus was on acquiring portfolios of existing commercial real estate and equipment loans from other lenders in our market space. Using the asking price for the portfolio, the cash flows from the loans and the return rate required (as a discount rate), the NPV could be determined. Further, by running sensitivity on the asking price (investment size), we could determine the price range within which the purchase could be justified. The key to this valuation was allowing the BD director to know what the ROI would be on the purchase at alternative prices, and the absolute maximum price that could be paid and still return an acceptable ROI. 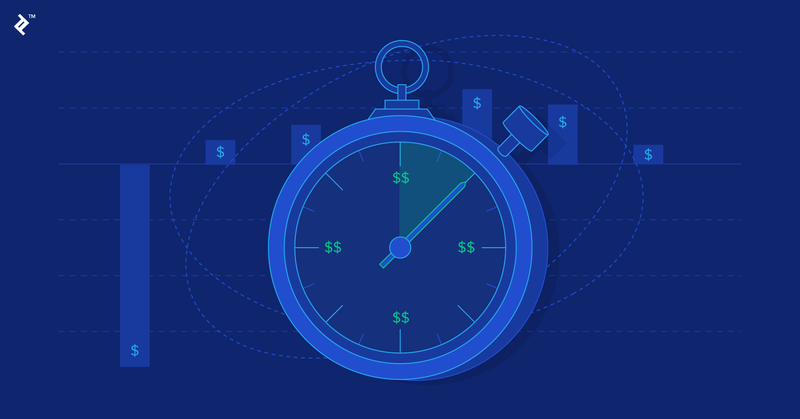 When I implemented this process, it improved purchase negotiations as the director could negotiate price in real time without the need to pause negotiations to rerun the numbers. Several consulting clients have asked me to project operational performance for new business ventures. Using capital budgeting techniques, the financial feasibility of the new venture can be determined. 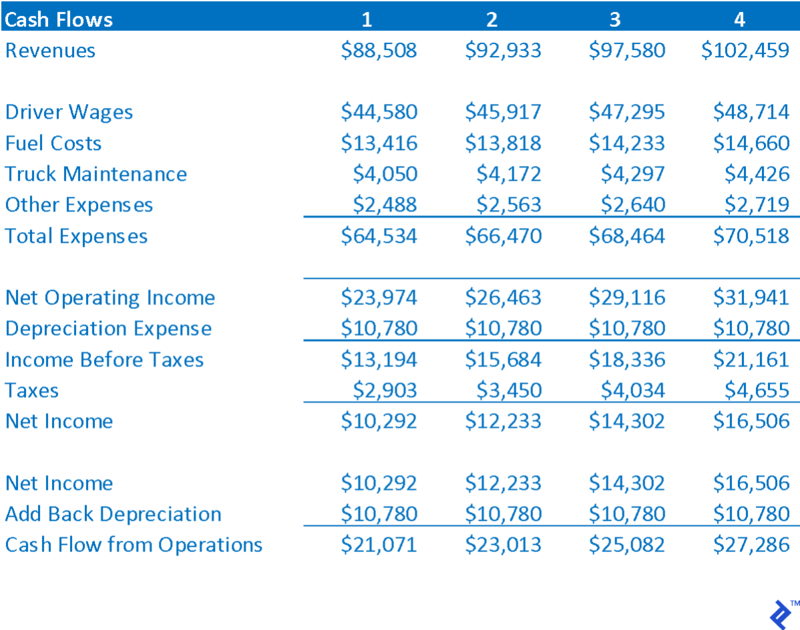 One client had developed a proprietary fitness equipment product, the capital budgeting analysis for that company is shown below. As operations were expected to continue beyond the 5-year projection, a terminal value was used in the analysis. The sensitivity analysis showed that the NPV remained positive, so long as the capital investment was less than $2.6 million, and cash flow could drop to 87% of projected levels (with all other factors held constant). The key to capital budgeting is the accuracy of the projected cash flows. The total investment is often easy. However, making sure to account for all sources of cash flow can be all-encompassing. In addition to revenues and expenses, large projects may impact cash flows from changes in working capital, such as accounts receivable, accounts payable and inventory. Calculating a meaningful and accurate residual or terminal value is also important. In my experience, failed attempts at using capital budgeting came from not using detailed projections of project cash flows. I worked with one company who attempted to evaluate the purchase of another company by using the target’s projected income statement as the sole basis of operating cash flows. It used net income, which is NOT cash flow. Further, it completely ignored the impact to cash flow from changes in working capital. Lastly it did not accurately allow for a residual value. This all seriously understated cash flow, leading to an apparent value (investment amount) less than the seller would accept, and which ultimately was less than the fair market value of the company. One should also be careful not to overestimate a residual or terminal value. I have seen projections for starting a new venture where the residual value was the anticipated value to be received upon taking the company public. The IPO value was far above a reasonable amount, and without the high residual value the NPV would be negative. 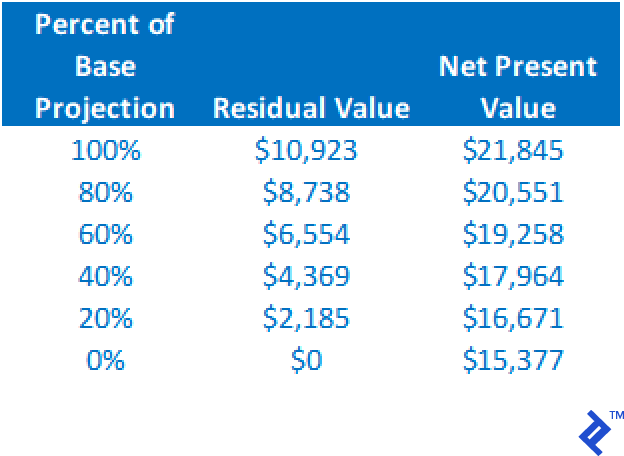 Placing too much of the NPV value in the residual can be a mistake. The greater the amount of an investment, the greater the risk of error. Key to preparing a successful capital budgeting analysis is finding someone with the expertise and experience to calculate accurate and reasonable cash flows. If a business does not have a person like this on hand, it does become more of a passion play and less an exercise in critical business judgement. What do you mean by capital budgeting? What is the process of capital budgeting? How do you calculate net present value? What does the IRR tell you?